Colors: White with possible ticking. one dark marking is allowed on the head. Basenji are small, unusual, elegant, athletic dogs about the size of a fox terrier, with a smooth shiny coat of copper, red, black and tan, black and brindle. Usually with white feet and white on the chest and tip of the tail. Individuals may also sport a white facial blaze, white legs and/or a white collar. The back is level; the legs are long, and the forehead is furrowed with wrinkles, giving it a worried look. The ears are straight and open in the front and its tail is set high and curls up over and slightly to either side of the back. Its eyes are small and almond shaped. Its thighs are muscular, and it has a flat skull. The breed has a distinctive, horse-like running gait. The Basenji does not bark, but does have a lot of other unusual vocalizations. He may yodel, howl, growl or crow, depending on his mood. 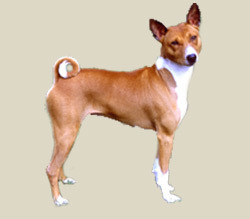 Unlike most other domestic breeds, which have two heats per year, the female Basenji comes into heat only once a year. Some consider the basenji to have terrier-like mannerisms because it is feisty for a hound. More often it is considered catlike in mannerisms: clever, inquisitive, stubborn, independent and reserved. Its hunting roots are very evident, as it loves to chase and trail. It needs regular mental and physical stimulation, lest it become frustrated and destructive. Basenjis may be barkless, but they are not mute. They do make a sort of yodel, howl and shriek � and occasionally bark, but just one or two "fox barks" at a time. The basenji is an active dog that needs daily mental and physical exercise. Its needs can be met by a long walk followed by a vigorous game, or by running freely in a safe, enclosed area. It can live outdoors only in warm climates and generally does best as an indoor dog with access to a yard. Coat care is minimal, consisting of only occasional brushing to remove dead hair. The Basenji washes itself like a cat and has no doggie smell, so very little grooming is needed. This is a good dog for people with allergies. This breed sheds little to no hair.